Below are some notes and observations about the various feeder insects, vegetables, fruits, and rodents available to feed your reptiles and amphibians. Special attention is paid to nutritional value, as well as how to breed feeder insects and rodents. Roaches make excellent feeders for lizards, frogs, and toads. There is one species of roach that, in my opinion, stands head-and-shoulders above the rest: Blaptica dubia. These are often referred to simply as "dubias" but are also known as Guyana Orange-Spotted roaches. The reasons are many. Dubia roaches are my absolutely favorite roach because they don't stink, they don't make noise, they can't jump, they can't fly, they can't climb smooth vertical surfaces, and they don't bite. It's as if they were genetically engineered specifically for the reptile hobby. Serendipity baby. 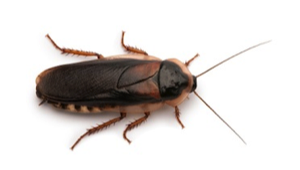 Roaches are comprised of 61% moisture, 28% protein, 6% fat, 3% carbohydrate, and 2% ash. I truly believe that, if people can get past the stigma of roaches, they will become the most popular reptile feeder insect on the market. I really can't imagine a more perfect feeder insect. The added bonus of dubia roaches is that they are really easy to breed, thus providing a constant and sustainable source of food for your reptiles and amphibians. Starting a colony of dubia roaches is really simple. Begin by purchasing a medium-sized plastic bin, and cut a 4" by 4" hole in the lid to provide ventilation for the insects. Cover the hole with metal or plastic screening, securing it in place with heavy duty tape or a glue gun. Attach a heat pad to the bottom of the bin (on the exterior), covering about 50% of the surface area. You want to get the inside air to between 85F and 90F degrees, a temperature that will keep the roaches at peak activity (and this also mean peak reproduction). Add a few vertical egg crates so that the roaches have somewhere to hide and breed. No substrate is needed since dubia roaches are live-bearers. 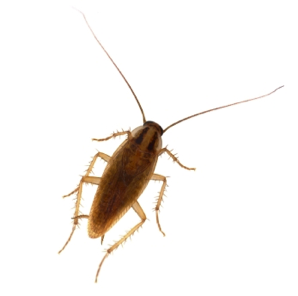 You can expect that each adult female will produce approximately 20-50 roach nymphs every 28 days. Dubias are sexually dimorphic, making the sexes easy to identify: males have fully formed (non-functional) wings, while females have very small (non-functional) wings. Feed dubia roaches throw-away vegetables, fruits (they love oranges), breads, nuts, and dog food. Be very careful not to allow much moisture into the bin, as it can literally wipe out an entire colony of roaches in a matter of days. I prefer to feed them dry dog food. Dubia roaches require water, but a simple water dish will result in many drownings, just like with crickets. One of the best investments you can make is purchasing some Soil Moist polymer crystals—please see my review a few paragraphs below. It's worth its weight in gold and no reptile or amphibian keeper should be without it. One big advantage dubia roaches have over crickets is that they have considerably longer lifespans. For example, crickets live for several weeks, while dubia live for 12 to 18 months. Dubia also attain a much larger size, at about 1.5" to 2" in length (at birth they are about 1/4", perfect for small reptiles or amphibians). The only mild disadvantage is that dubia roaches take longer to mature, about four months. A reproducing colony of 1,000 or so roaches will contain every variety of shape and size for your hungry herps to eat. 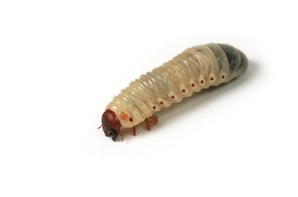 In all, dubia roaches are an ideal feeder insect for all sizes of lizard, frog, and toad. They can be difficult to find locally, as most pet shops do not carry them. Your best bet is to order them online. If you do, try to start with a ratio of one male to four or five females. The value of crickets cannot be understated. They hold the title of the most popular reptile and amphibian feeder insect in history. No other insect induces such a strong feeding response in lizards, frogs, and toads. Crickets are comprised of 69% moisture, 21% protein, 6% fat, 3% carbohydrate, and 1% ash. While I consider crickets an indisposable feeder insect within the reptile hobby, they do have their drawbacks. They can stink at times, drown easily (see the Soil Moist notes below to avoid this), are notorious escape artists, and they bite. Considering they are around 11-cents each at most pet shops, you may justifiably be thinking about breeding crickets to save money. No one would blame you, after all, that's more than a dime every time your reptile eats one. My best advice, simply put, is don't. Not only are the baby crickets absolutely miniscule, but you'll probably experience significant die-offs along the way. You also must provide an egg laying substrate, which isn't easy, and it tends to smell. The best option, and trust me on this, is to buy crickets in bulk quantities online (this is what all pet shops do). When you buy crickets in bulk, you're essentially buying wholesale, and your dollar goes much further. It also means your herps will have constant food available to them, which is a good thing. We all know that procrastinating that "cricket run" to the pet shop is easy to do. Here's the math (stay with me as this is going to save you a lot of money). 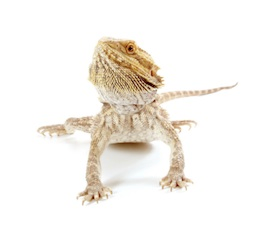 If you're purchasing four-dozen crickets per week for your reptile or amphibian, it costs you approximately $5.28. Now, if you bought 500 crickets online, you'd pay approximately $25 (this includes shipping), which equates to 5-cents per cricket. That's an immediate savings of 55%, not to mention you didn't have to drive to a pet shop—you ordered from the comfort of your own home. You also saved on gas costs. If you increased your order to 1,000 crickets, the price per cricket drops to just 3-cents. It's incredible, a savings of 66% off retail. At such low cost, you can afford to lose some. You can keep the crickets alive in a plastic bin with ventilation. Provide them with some egg crates to climb on, as well as water via Soil Moist crystals (a water dish will result in countless drownings). 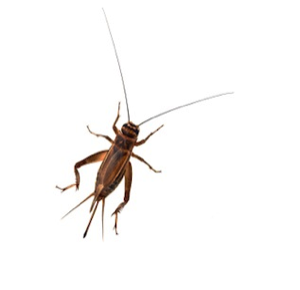 Crickets will eat just about anything, so feed them fruits, vegetables, or even dog food—the same things you would feed dubia roaches. It's a great idea to dust crickets with a top quality vitamin or mineral supplement prior to feeding your herps. These two feeder worms are very similar in appearance, but superworms attain a larger adult size. Let's take a look at each species separately. Mealworms are comprised of 64% moisture, 19% protein, 14% fat, 3% carbohydrate, and 1% ash. Definitely the second most popular lizard and amphibian food of recent decades, mealworms vary in size from a grain of rice to about one-inch in length. This makes them an ideal match for many different sized lizards, frogs, toads, and salamanders. Avoid the "giant" mealworms that approach 1.5" in length as they have been treated with a hormone to prevent them from changing into a beetle. They're basically mealworms on steroids. If you need something larger, just buy superworms instead. Mealworms and superworms come in handy, especially when trying to feed small lizards, frogs, or toads (even turtles or tortoises). They also can't climb, which is nice, and they tend to be one of the most convenient reptile or amphibian foods when kept in the refrigerator. Let's debunk a very common mealworm myth. There is a popular rumor that mealworms can, in certain instances, chew their way out of a reptile or amphibians's stomach. It's a myth, so don't believe it. It's not true for superworms either, so don't worry. Mealworms are easy to maintain, and can be kept in one of two ways. The first option is keeping them at room temperature, in which case they will eat, grow, and eventually morph into beetles. The second option is keeping them in the refrigerator, which puts them into a type of dormancy, and they will not eat, grow, or begin morphing. If you decide to keep your mealworms at room temperature, just make sure they are in a container of wheat bran or uncooked oatmeal (food source), and remember to add a few small pieces of apple periodically (water source). They will last a few weeks, and I usually only do this if they will be fed to my reptiles within a fairly short period of time. If you decide to keep your mealworms in the refrigerator, you can safely assume they will last for several months, and you don't need to provide any wheat bran, uncooked oatmeal, or a water source. It's as simple as it gets. Breeding mealworms is basically effortless, although it does not happen quickly. Just give them plenty of food and keep them between 65F and 90F. That's it. Superworms are comprised of 59% moisture, 19% protein, 15% fat, 6% carbohydrate, and 1% ash. As you can see, feeder superworms and mealworms have almost identical nutritional value, with the superworm being slightly more rich in fat and carbohydrates. 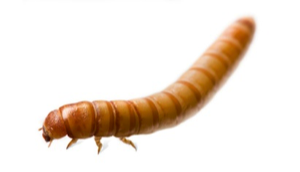 Superworms are about 1/2" longer than giant mealworms, and their chitin (exoskeleton) is supposedly moderately thinner when compared to mealworms. This is advantageous as it means superworms are potentially easier feeders to digest. Do not refrigerate superworms—it will kill them. Also, they are overtly sensitive to smoke. Superworms can be maintained in a container with wheat bran or uncooked oatmeal, just like mealworms. Add a potato slice to satisfy their moisture needs, and keep them at room temperature. 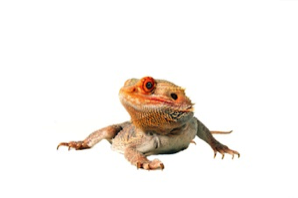 Superworms are more ideal than mealworms for larger lizards, frogs, and toads primarily because of their meatier size. Be aware that they will sometimes pinch you. Breeding superworms just isn't worth the effort. The fact that they are cannibalistic if food is scarce means having to constantly remove the defenseless ones that are morphing into a beetle, and that alone is hassle enough to avoid attempting to breed them. I recommend dusting your mealworms and superworms with a top quality vitamin or calcium supplement immediately prior to feeding, although their smooth bodies mean it doesn't stick to them all that well. Buy some live feeder mealworms for sale. In my opinion, mice make the absolute best feeders for larger reptiles and amphibians. Remember, whole food items always make the best, most complete reptile and amphibian meals. Let's start at the beginning with pinkie mice. These blind, hairless little morsels do in fact provide considerable nutrition for your reptiles. There is a myth floating around that pinkies are unusually high in fat, and notably low in calcium. Nothing could be further from the truth. Pinkies contain an average of just 5% crude fat. That's not much. Not only that, but they are packed with protein. Their transparent bellies allow you to see their white stomach—it's a veritable gold mine of calcium. Reptiles with big appetites can be expensive to feed. Feeder mice range anywhere from $1 to $3 each, depending on where you look. Based on this, many reptile hobbyists choose to breed their own mice. It's fairly simple, and can actually be pretty fun. Here's how to do it. Purchase a ten gallon tank, some aspen bedding, a hanging water bottle, a compact hiding spot, and a food dish (just feed them a quality dog food). Some reptile stores sell pre-built mice breeding cages, which can work well too, but the plastic base can absorb and hold odors, whereas a ten gallon tank is made of glass and won't retain an unpleasant smell. Start with young mice in the two-month old range. If possible, purchase non-related mice, and they will be more productive than related ones. They breed well for about a year, so this will maximize the amount of reproductive production you can expect. Buy one male, 3-5 females, and add them to the tank simultaneously. You usually don't want to add mice to an existing group, as they will sometimes kill the "intruder." 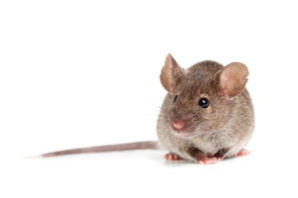 Keep the mice well fed and well watered, with an ambient temperature of between 50F and 80F degrees. You can expect that each female will produce a litter of pinkies every 25 to 28 days. Litters vary greatly in size, but it isn't uncommon to receive 10 to 15 young. It's hotly debated as to whether you should remove the mother and her babies once she gives birth. The reason is, mice can get pregnant right after having a litter, and it's a little tough on her body to be pregnant and nursing constantly. The problem with removing the mother so that she can nurse her young, is that you lose out on a month of production. It's your call. I leave the mothers and their babies in the tank at all times. Cannibalism of pinkies by the adults does happen once in a great while, but can be avoided the vast majority of the time by making sure there is plenty of water made available to the mice. Finely-shredded aspen bedding (think sawdust) is far more absorbant than the shaved variety. This means less odor. Find a farm supply store and purchase bedding and mouse food in bulk. Mazuri is a fantastic scientific blend for rodents, and it's fairly inexpensive. Dog food works really well too. Never use cedar bedding—it's toxic to mice. Clean the cages at least once per week to reduce odor, and rinse with a 5% bleach solution. Never use a water dish. Instead, invest in a hanging water bottle—you'll be glad you did. Water dishes fill with bedding and food constantly, and need to be cleaned and refilled several times per day. A water bottle, on the other hand, can be fine for days on end. Some reptile hobbyists worry about hair impaction. This is when the hair from repeated meals of mice accumulates in a reptile or amphibian's intestines to the point of becoming life threatening. It isn't common, it isn't natural, and I've never witnessed it. Here's the thing: make sure your reptile has enough heat to aide in digestion, and you never need to be concerned about impaction. Feel free to feed your reptiles pinkie mice live, but never feed a snake, lizard, frog, or toad live mice. Often times, the mouse will fight back by repeatedly biting the predator. This is most common with snakes. Instead, either humanely pre-kill the mice, or use frozen mice. Mice are nutritious whole foods for reptiles and amphibians alike, and can be prolific breeders to boot. In fact, many larger reptiles can thrive on a diet comprised solely of mice. There are a number of high quality, affordable online mouse suppliers. Both of these feeder worms look very similar in appearance, although the butterworm is quite a bit larger in size, reaching lengths of 1.5", whereas a waxworm maxes out at about 1". Another difference is that waxworms are very easy to find at reptile suppliers, while butterworms are relatively rare in the reptile hobby. Waxworms and butterworms are similar to mealworms and superworms in that you can refrigerate them until you need them, which means you don't have to offer food or moisture. They live off of their fat reserves, so the more time that passes, the thinner they will become. In this dormant state, waxworms will last about three weeks, and butterworms about two months. Make sure moisture does not accumulate inside the container as it can be lethal to them. Throw out the waxworms that turn black. Nutrition-wise, waxworms and butterworms are great sources of calcium—almost twice the calcium in most other feeder insects. Reptiles and amphibians seem to relish these worms at feeding time. Breeding waxworms is pretty straightforward, but not many reptile hobbyists do it. If you're curious, here's how: Leave them at room temperature and allow them to spin a cocoon, which will happen fairly quickly. They will then emerge as moths in a matter of days. The moths then lay eggs shortly thereafter. Once the eggs hatch, provide the larvae with a feeding brick of honey, uncooked oatmeal, and glycerine. Soon the waxworms will be large enough to feed to your reptiles. Sound like a hassle? It is. Keep in mind, they can climb smooth vertical walls. Butterworms are usually imported from Chile, which means they've been irradiated to prevent reproduction, and thus cannot be bred as feeder insects. While not what I would term a staple food, waxworms and butterworms can be great additions to a varied reptile or amphibian diet. You can purchase some live feeder waxworms at this site. You can also buy the following live reptile feeder foods such as nightcrawlers for sale. 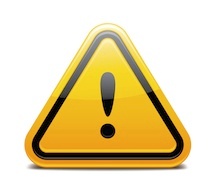 Avoid feeding your reptiles beef hearts, gizzards, livers, or chicken breast. These are not whole foods, they are partial foods, meaning it's just one small section of an animal. Sure it's inexpensive, but is that reason enough to feed your reptiles a food that will lead to nutritional deficiency? Of course not. As if that weren't enough, if you cook these foods, they lose much of what little nutritional value they had in the first place. Avoid feeding your herps fish, especially feeder fish. Fish reduce niacin levels in herps, which is a bad thing. Not to mention, fish often carry numerous internal parasites, which can in some instances be passed to your reptile or amphibian. I know it's fun to watch your lizard, snake, frog, or toad eat fish, and it probably won't directly lead to the herp's death, but is it worth the risk? No, it isn't. 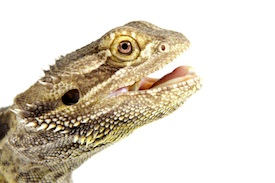 Avoid feeding your reptiles wild-caught insects. Pesticides are prevalent nowadays, and you just never know. Avoid feeding your larger herps readily available lizards such as house geckos and anoles, especially if you've got a captive-bred animal. Lizards are a favorite meal for many reptiles and amphibians in the wild, but they almost always carry internal parasite loads that can, and likely will, be transferred to your herp. If you've got a snake that refuses to eat unless it's a lizard, try scenting a mouse with a live lizard instead—it often times works. If all else fails, you can buy live feeder lizards for sale, with a choice of anoles or geckos. Avoid feeding herbivorous and omnivorous reptiles iceberg lettuce. Its got virtually no redeeming nutritional value. Use romaine lettuce instead. Avoid feeding your reptiles and amphibians live mice (pinkies are fine to feed live). They often times bite back, and can leave nasty, deep cuts that have a tendency to get infected. This seems to happen most often with snakes. Feed frozen (thawed) or freshly killed mice instead. Once in a while a product comes along that literally improves your life in a measurable way. Soil Moist doesn't just make my life easier, it also saves me time and money—what more can you ask for in a product? The funny thing is, Soil Moist wasn't even developed for the reptile hobby--it was designed for gardeners to keep their plant roots wet. How does that translate into a useful reptile tool? Here's how. If you've ever kept crickets, roaches, mealworms, superworms, or any feeder insect, you know that they drown easily. So easily that you start to wonder how they even survive in the wild. Most insects can't swim, and that's why feeder insects and water dishes don't mix. The solution is Soil Moist. Each can contains polymer crystals, which look like clear grains of sand. When you combine a teaspoon of Soil Moist granules with a cup of water, the magic begins. Each Soil Moist granule absorbs water, so much so that it swells to around 100-times it's original size. They form neat little water cubes, for lack of a better word. Now, place the water cubes into an empty water dish instead of water, and your feeder insects can climb all over them, and drink to their heart's content, without any risk of drowning. It's my favorite new reptile tool. It gets better. A can of Soil Moist will probably last you a year or more, even if you constantly have feeder insects to maintain. Large pet stores now carry pre-made water cubes, which means a single bottle costs you about $10—a total ripoff. The same $10 can buy you a year's supply of polymer crystals, allowing you to mix your own, at your own pace. Not only is it extraordinarily cost efficient, but it's fun to do, and is 100% safe for your feeder insects. No chemicals or additives. I've added a link directly below for those of you who would like to purchase Soil Moist. There are very few reptile or amphibian products that I think are must-haves, and this is definitely one of them. Earlier I mentioned that it's a very good idea to dust your feeder insects with a top quality vitamin or calcium supplement. It's important that you don't use both at the same time, however, as they have a muting effect upon each other. Dust feeders with a vitamin supplement one day, and a calcium supplement the next. And repeat. My personal favorites are made by Rep-Cal, a reptile and amphibian supplement maker that has earned its reputation for excellence, quality, and purity. There are many different supplements out there, all claiming to be the best, but most are either diluted, or the ingredients are subpar, or both. Hopefully my attempt at detailing the various reptile and amphibian foods has broadened your knowledge in this very important and often overlooked topic. Kudos to you for taking the time to research the myriad of available foods for your lizard, snake, frog, toad, salamander, turtle, or tortoise. Please contact me with any feedback, requests, or suggestions.